Well it has been a couple of really exciting days for us. Yesterday we got our shipment of Lupine Collars and Leashes. We decided to carry these at the daycare because 1)They are good quality, 2)They are attractive, 3)No one else in town carries them and 4)They are guarranteed – even if chewed! We have 9 different styles of dog collars and leashes and 3 styles of cat collars. Coulee is wearing the flower power collar. Then to add even more excitement to our week, the calendars arrived today! I have to admit I was holding my breath when I opened the box because we hadn’t seen a sample before we ordered $500 worth of calendars. But they look really good and I’m very happy with how they turned out. I hope everyone else enjoys them too! We only have 3 extras so if you didn’t order one but want one, you better stop in soon. I have to admit, when Amanda first suggested we host a dog halloween party, I was a little less than enthusiastic. I have been so busy lately that the thought of doing one more thing “extra” was a little too much for me. But I agreed and Amanda ran with it. She did the decorations, the organizing, the planning, the advertising and everything else that needed to be done. And I’m very thankful. I’m not sure where she finds the time or energy but I’m glad she did because I had a GREAT time! 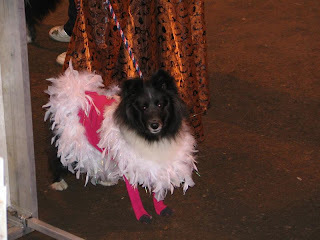 It was so fun to see all the dogs dressed up – some looked miserable in their costumes and others seemed to shine. Duke managed to destroy his before the party even started! We had a costume contest with prizes for the scariest, the cutest and best overall. (Jane was a close 2nd), Clyde won the cutest – he just suited his costume so well and Lucy the ballerina won best over all. We had weiner dunking (of course) and Tundra was the new champion. She was in a pretty slow heat to start – none of the dogs had done it before so they weren’t really sure what to do…but once Tundra figured out those were hotdogs floating in the water, there was no stopping her! We had a tricks contest – Pheonix won as he was able to roll over, say hello, weave through April’s legs and play dead. We also played musical mats (sorry no photos – I must have been napping) and Sadie was the winner (we think! – it was a long day). I also want to thank Sarah for putting together a scary music CD and helping out with the party, Amanda’s mom for baking some amazing cupcakes and Amanda again for all her hard work! Be sure to check out our Flikr site for lots more photos! 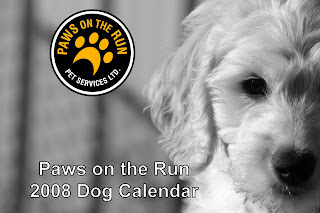 Today I had a call from someone asking about a bark collar that was on one of the dogs that they saw on our Flickr site and I thought maybe I should explain a little bit about what we do to keep the noise levels down to a dull roar. Some dogs bark when they are excited . At the daycare they can be excited a lot! Some dogs bark when other dogs are playing. I think they want the dogs to stop so one of the participants can play with them. It never seems to work because they are really good at ignoring other barking dogs. Some dogs bark whenever someone passes by outside. They all seem to bark if the person stops and stares! Some dogs (I’m not naming any names, Coulee and Tundra) tend to howl if we “ignore” them (you know for a whole 30 seconds or so!) and they get everyone else howling along. Spray the dogs with water. It is amazing how well this works. With most of them, we just need to be holding the water bottle and they won’t bark. With others, they bark to make us spray them because they think it is a great game! Use Citronella spray collars. We have a few at the daycare that we tend to rotate around the dogs depending on the time of day and what activities are happening. So for example, Coulee tends to wear a collar when the dogs are running around outside as she tends to instigate barking at people that are passing by, whereas Polly wears the collar in the morning when there is a lot of activity because she barks (loudly and shrilly) at other dogs playing. It is important for us to keep the barking to a minimum so that we keep our neighbors happy (they love watching the dogs play but I’m sure they don’t like listening to them!) and so that we don’t go crazy from all the noise. Amanda noticed Maggie Mae standing perfectly still staring through the fence. What could possibly hold her attention for so long? We’ve looked after Barley (golden retriever) and Ruby (bulldog) a few times but each time I either forget the camera, the batteries were dead or there was no “film” in it. So today they both came to the daycare and we were ready with the camera. For a bulldog, Ruby has some amazing energy. I don’t think she stopped all day…neither did Barley but he’s a golden and that is what we would expect! So at long last, here they are! Aren’t they cute? Amanda saw this on another blog and it was too cute not to share. It is frighteningly close to real life. What are you doing this Sunday (Oct 28)? Come join us for the 1st Annual Howl-o-ween Party! It is from 2-4 p.m. at the doggie daycare (242 12 St. N). We are going to have lots of fun doggy games, costume contests and of course yummy doggie cake from Diggers Delights! No need to RSVP just bring a toonie to cover admission. We hope to see you there! Today seemed to be the day for black dogs. By 9:00, 8 of the 11 dogs here were black or mostly black. They were all having a great time playing outside and Amanda got some of it captured on film. Here are a few to get you started. The rest can be found on our flickr site. Just a heads up. This post is not about pets…it is about an addiction I have. It all started about 2 weeks ago. Amanda brought a case of frozen grilled cheese from M&M’s to the daycare. 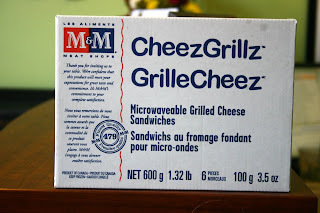 Yes – frozen, microwavable, grilled cheese. Sounds disgusting doesn’t it? I was horrified…but then I ate one when I was hungry and desperate and my addiction blossomed. I think I ate 90% of the sandwiches in the first case (there is only 6 so it isn’t that bad) and I’ve bought 2 more cases since then. So I thought I’d share with you all the wonder of the microwaved, frozen, grilled cheese. 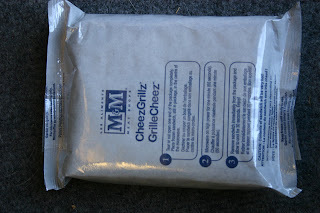 Here is what the individual packets look like prior to microwave. 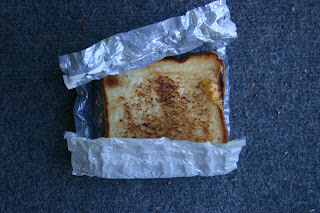 This is a picture of the sandwich in the microwave – 2 minutes to bliss! 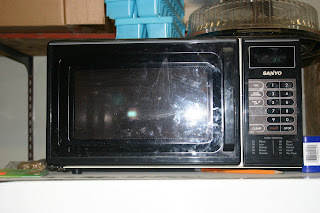 Here it is after being microwaved. 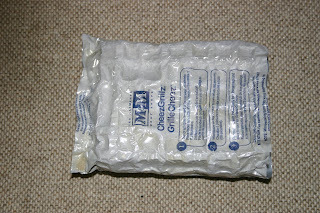 I think the secret of the sog-free sandwich is all in the packaging. It is weird and wonderful. And last, but not least, here is the finished sandwich. Yum! See, I told you I was obsessed. But I think Amanda is on her way as well – she has just gone to have one because mine smelled so good! So just in case there are some of you out there who don’t believe me about my bad cat pictures (and hence no cat calendar), I thought I’d show you an example from this morning. This is Mau. She is a beautiful cat but you probably can’t tell from the photos I took. Chewy loves to hang out with the dogs and sometimes we’ll even find that she has crept into the main play area with the dogs. So one afternoon, I put her in the smaller play area where there were no dogs. This way, she could still be with them, yet not have to worry about a energetic pack chasing her. Before long, she had gathered a little crowd of spectators and I had to get my camera because it reminded me of her watching the fish. I guess now she knows how it feels!